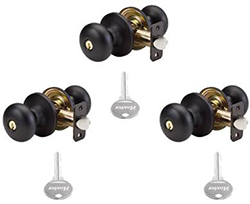 Master Lock offers a variety of keying & service options for door hardware products for you to tailor your door locks exactly how you need them. 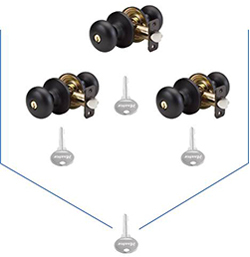 Keyed Different (KD) – Each door lock is opened by its own unique key that does not open any other lock in the set. Keyed Different is the standard keying default on Master Lock and American Lock door locks. 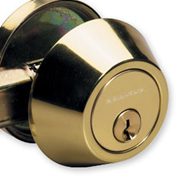 Master Keyed (MK) – In a Master Keyed system, a master key opens all the locks in the system although each door lock also has its own unique key. This permits organizing master key systems along departmental or other functional lines to allow supervisory or emergency access. 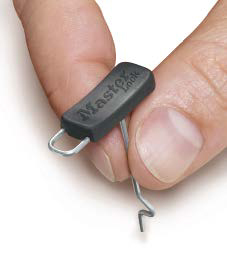 MK in the product number designates that the products will be Master Keyed. If the customer is adding on to an existing MK system, please specify the master key code. 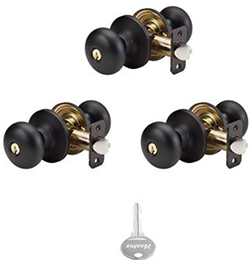 Rekey locks when needed, as often as needed. 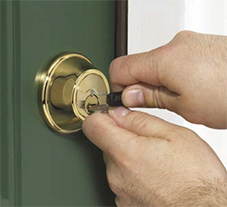 A unique patented cylinder enables multi-family property security managers to take control of the process of changing locks with every chance in occupancy. With this Quick Change (Qci) recodable door hardware, managers can rekey locks using a simple change tool in as little as 15 seconds.